A baby humpback whale has recently been freed from the clutches of a mesh shark net, much to the relief of his mother and concerned beach-goers. The 16-foot baby whale became entangled in a shark net off Queensland's Rainbow Beach in Australia sometime during the early morning on October 16 (AEST time). Queensland Boating and Fisheries Patrol was alerted to the little whale's predicament and came to the creature's aid. The mother whale did not leave the scene and looked on as a team assessed the situation. As the team worked, Jeff Krause, manager of Queensland Shark Control Program, asserted that the baby whale was not in any danger. "It's pretty well wrapped up in one of the nets but it's breathing easily ... It's on the surface so there's no imminent danger of it drowning or suffocating which is great news and the mother whale is hanging around very closely, as mothers do, to protect its baby." Luckily, Mother Nature was also cooperative, as Krause said that "Sea conditions (were) very good for the team to assist in the release of the whale." This is the eighth whale to be caught in one of Queensland's shark nets this year. 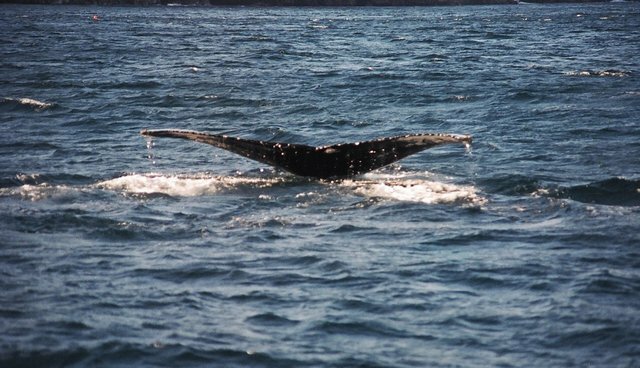 "But we've got roughly 20,000 whales migrating back home," says Krause. "It would be naive of us not to expect that we would entangle at least one during the southern migration." Though shark nets are in place to protect swimmers and beach-goers against shark attacks, many are critical of the mesh nets. Humane Society International's Alexia Wellbelove wrote in an opinion piece for ABC that shark nets are "indiscriminate killers" of all kinds of marine life. "Shark nets were a solution implemented in the 1950s when our coastal waters were dirty and often contaminated with offal and blood from meatworks disposed of in our waterways. The situation is now much different and it is time to modernise our approach." However, Primary Industries Minister Stephen Whan tells the Sydney Morning Herald that the evidence speaks for itself. "In over 50 years, there has not been a fatal shark attack on a meshed beach.'' Fortunately for this mother whale and her offspring, the shark net situation ended on a happy note (though this has not always been the case for whales stuck in mesh nets). Mother and baby whale swam away together after the baby whale was freed.